In the evening, after 6 pm, all the tigers come out as if at a command. Kuzya lies down on a hill top or in a clearing. Boria climbs up on the grotto roof. 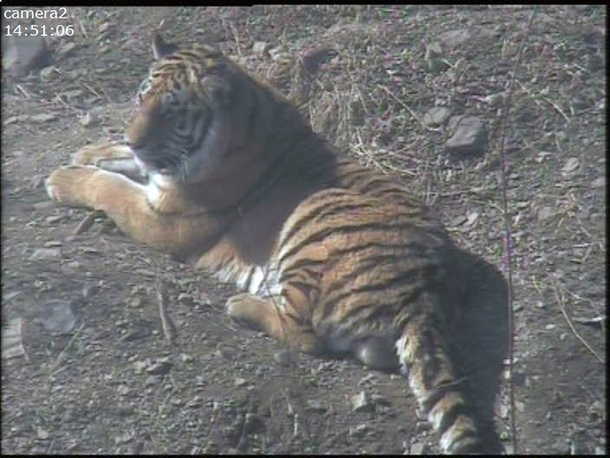 Ustin lies down in a small clearing with a view of all the enclosures. 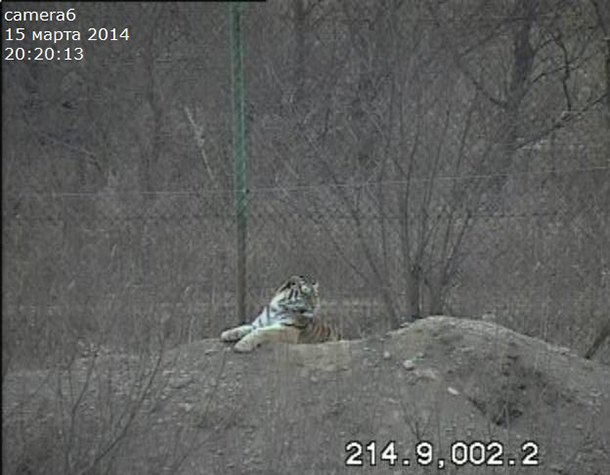 And the two females– Svetlaya and Ilona – lie down on a path with a view of Ustin's enclosure. Once stationed at their respective observation points, they watch. The tigers look imperturbable during this time, just slightly turning their heads and moving their ears. Their subtle movements for the next 40 minutes appear synchronized. Studies of circadian and other biological rhythms of maturing animals are very important; they help us understand tigers' needs when they go through this stage in their development. The tigers’ behavior in their enclosures is a simplified model of their future behavior in the wild, which they will be able to realize in full once they are released. Spring is coming to Primorye. The sun is warming the ground during the day and the temperatures rise to +10° C, but at night, the temperatures drop below the freezing point, down to -10° C. It's full moon. No precipitation observed. We are watching the tigers from the distance, through camcorders. Their enclosures have camera traps, which allow us to track the tigers’ activities during the night. Between 9:30 am and 6:30 pm, the tigers are practically invisible. Occasionally a tiger passing from one sleeping place to another can be noticed, and that's all. All the tigers prefer to rest under a cover, among the bushes and tall grass. Suddenly Boria jumps down quickly from the grotto and heads for his feeding spot where he starts on his leftovers. All the tigers have their “canteens.” They bring their kill to the same spot after each hunt, and feed there. Kuzya decides to patrol the enclosure, walking along well-worn paths, repeating his steps from previous days. At the same time Ustin suddenly leaps up and prances around the enclosure with his tail high up in the air—a kind of playful scamper for the tigers. The females, curious to see what is happening, get closer to watch. Tigers' playful scampers are very brief, but can be repeated in numerous series. Ustin runs towards the females. They sniff each other and touch cheeks. Then Ustin lies down opposite the tigresses. 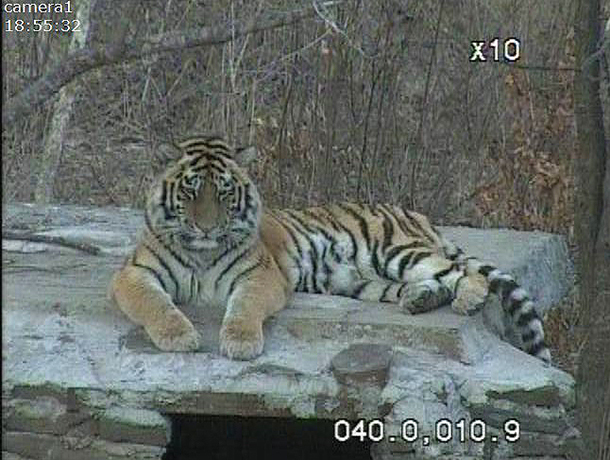 Kuzya breaks into prancing in the adjacent enclosure. Kuzya catches up with Boria, touches his brother’s sides with his front paws, and they start a brief wrestling match. Around 7:40 pm, the females move away from their neighbors' enclosures and deep into their own. 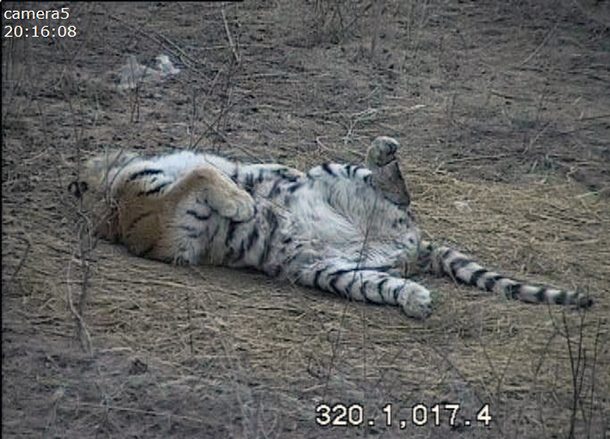 The tigress Ilona starts examining the hill and the ditch, and Svetlaya lies on her back, belly up, and has a roll in the clearing. Such relaxed behavior indicates that she is comfortable. Then she jumps back on her feet and runs towards Ilona playfully, trying to catch her tail. An hour later, they all start walking along their paths. They like walking together along the fences separating their enclosures, watching each other. During this time, the tigers can mark their territories, check on their food caches, or chase annoying crows. The tigers stop, listen out, and then continue their walk. They constantly apprise their surroundings. At the slightest alarming sound, the tigers conceal themselves on the spot. If nothing dangerous follows, they resume patrolling their small territories. But if something bothers or alarms them, they move to less accessible spots - into ditches or bushes. They can stay in the same place without moving a muscle for over 40 minutes. The tigers have amazing self-control! After an hour-long walk, the tigers go to their watching spots, lie down and rest for a while, looking and listening out. Then they repeat their routines of playful prancing, patrolling their territories and watching each other. And so it goes until the sun rises comes. Then mid-morning they go for a long sleep, only to start the same “daily” routine again as twilight comes. For more information about IFAW efforts to save the last of the world's wild tigers, visit our campaign page.